President Donald Trump has said the US will "begin cutting off" foreign aid to Guatemala, Honduras and El Salvador over the unfolding migrant crisis. Mr Trump criticised the countries on Monday for allowing people to leave the region and come "illegally" to the US. "The Caravans are a disgrace to the Democrat Party. Change the immigration laws NOW!'" he said in an earlier tweet. On Sunday, the migrant caravan reached the town of Tapachula, approximately 37km (23 miles) from Mexico's southern border with Guatemala. "We have sunburn. We have blisters. But we got here. Our strength is greater than Trump's threats," migrant Britany Hernández told AFP news agency. 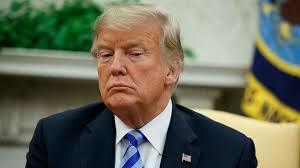 Mr Trump on Monday also urged people to blame Democrats for the border crisis, saying: "Remember the mid-terms". Conservative media in the US have honed in on the president's claims that the group is full of people - and criminals - seeking to illegally enter the US, as well as his remarks blaming Democrats for the crisis. Why have they formed a caravan? Migrant caravans of this scale are a recent phenomenon. While Central Americans have long fled their homelands for the US and have sometimes joined forces along the way, the organised nature of these caravans is relatively new. This is the second such caravan to leave Honduras this year. A similar convoy reached Tijuana on the southern border of the US in April after travelling 3,500km (2,175 miles). That march was organised by a rights group calling itself Pueblo Sin Fronteras (people without borders) which says it is trying to draw attention to the plight facing the migrants at home and the dangers they run during their attempts to reach safety in the US. For the migrants, especially the most vulnerable ones such as the elderly and mothers with small children, the caravan offers more security than setting off on their own. Migrants are often kidnapped by people traffickers and drugs gangs who force them to work for them. A large group is harder to target and therefore offers more protection. How many migrants make up the caravan? The exact number is hard to determine as the group has split up. Some are already in the Mexican city of Tapachula while others are still at the Guatemala-Mexico border. Some estimates put the number of migrants who left Ciudad Hidalgo for Tapachula on Sunday at 5,000 while a Mexican federal police commander gave a lower number of 3,000. Another 1,500 migrants are estimated to be waiting to cross at the Guatemalan side of the border. A newly formed group of 1,000 mainly Honduran migrants has also set off for the US. Honduran President Juan Orlando Hernández urged citizens not to join the caravan. His country has also sent buses to the Mexico-Guatemala border to repatriate those who may have changed their minds about heading to the US or who are simply too exhausted to carry on. According to official figures, 3,400 Hondurans who had formed part of the caravan have returned to their homeland. Mexico said it would stop those who did not have passports or the correct visas at its southern border. But faced with thousands of migrants and after initial clashes, riot police got back on the buses that had brought them to the border bridge. About 900 migrants crossed the river and made it into Mexico, without the police intervening. Mexican officials say they have been encouraging the migrants to apply for asylum and that more than 1,000 have started the process. Those whose claims are rejected by Mexican officials will be deported. Those who managed to cross into Mexico expressed their joy at having it made that far. Many shouted "Yes, we could!" and "we won't stop". "We're exhausted, it's been a terribly difficult journey but we have hope: we've made it to Mexico, which means a lot to us," a migrant called José Luis told BBC Mundo. A woman called María, who is taking part in the caravan with her husband and her two small children, told BBC Mundo's Ana Gabriela Rojas: "We are very happy to be here and we ask Mexican authorities and people to let us pass through. We are just looking for a job and better living conditions."